The driving range at Eagle Vale is second to none. The main driving range area has 25 FiberBilt grass hitting mats, the best in the industry. A dozen of those mats allow you to put your own tee in the ground, making it easier to tee your golf ball at the exact height that you want! There are driving range trays at every station to hold your entire bucket of balls. We off two bucket sizes, medium and large. The medium bucket holds 50 balls and is $7, while the large bucket is 100 balls for $11. There are always 3-4 club cleaning units handy for you to keep your clubs clean and free of debris. We also have a grass area where 8-10 players can hit off regular grass. Adjacent to the driving range is one of the nicest and largest practice putting greens in all of Rochester. 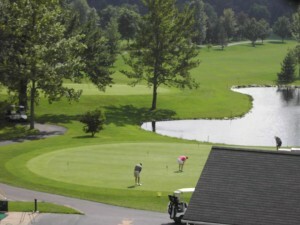 It features plenty of undulation and is consistent as the greens on the golf course. Along with the putting green, we have 3 other greens designed for bunker play and chipping and pitching practice. We have yardage markers on the range from 100-250 yards out and all of our simulated greens on the range are well marked. The range is lit at night from Memorial Day thru Labor Day, so you can hit range balls in the later evening as well as any time during the day.